What's More Embarrassing Files: The Rangefinder Usage Penalty, Or That You Were Using It From 40 Yards Out? At this week's Sage Valley Invitational the world's top junior players are not allowed to use rangefinders to gauge distances. As Brentley Romine reports for Golfweek, first round leader Akshay Batia battled winds and a self-imposed mistake to post a first round lead-tying 68. Cringeworthy that he mistakenly forgot the rules for the week and was penalized two strokes? Naw. That he pulled out rangefinder from 40 yards...at least to old fuddy-duddies like me? Yikes! Then, just like he is accustomed to doing in most of his junior and amateur tournaments, Bhatia reached in his golf bag, pulled out his rangefinder and shot his number. But Bhatia quickly got a sinking feeling in his stomach. His playing competitor, Michael Sanders, asked Bhatia if he had just used his rangefinder. Knowing that rangefinders aren’t permitted this week at the Junior Invitational, Bhatia replied honestly. We should all applaud the PGA Tour for testing out how distance measuring devices look and play at some of their "other tour" events. But as someone who has followed the issue from the day the USGA mysteriously started advocating for another costly device, I've always been a bit amazed at the lack of statistical backing for these devices as pace enhancers. So again, we must have good players kindly explain how the devices are essentially a backup tool to them in real championship conditions. Or when they blow one into the next fairway. “I don’t think it’s going to make any difference to speed of play,” Rose said. “We don’t play ‘one number’ golf. We want to know what it is to the back edge of the green; we want to know the distance over a bunker. We want to know what the distance is to a certain slope. Rose’s sentiment was echoed by multiple other players, who added that the utility of rangefinders will hinge on how players choose to use them. I'm happy to wait out the experiment, but unless the PGA Tour is willing to subsidize the cost for juniors, advocating these devices means they will encourage young and aspiring golfers to believe they need such pricey devices. And just like that, the entry barrier to golf that any sane individual says we must break down, become $300 more expensive. I mean, that's money they could use to subscribe to PGA Tour Live! For seven years! The good news? The PGA Tour is using the Web.com Tour to experiment with something new. The reluctance to do so has always been a surprise at how little this tour, the other satellite tours or the Champions Tour are not used to test formats or rule changes. Allowing the use of rangefinders on such a stage will, once and for all, allow us to see if they speed up play on the professional level and how they "look" to a television audience. I suspect, as we've seen with other elite golf where players use rangefinders as a way to double check what they learn via traditional yardage books, that play will not speed up. There will also be the dreadful optics of watching someone looking through a device, which is about as fun as watching people test virtual reality devices. Perhaps the rule will allow caddies to use them but not players? But now we'll have data and visuals so that we can remember how rangefinders really only help when a player hits their tee shot into the other fairway. PONTE VEDRA BEACH, Fla. (March 28, 2017) – The PGA TOUR has announced that it will begin testing the use of distance measuring devices during competition at select tournaments this year on the Web.com Tour, Mackenzie Tour-PGA TOUR Canada and PGA TOUR Latinoamérica. Each of the three Tours will allow use of the devices by players and caddies at four consecutive tournaments, including Monday qualifiers. For these events, the PGA TOUR will temporarily enact a Local Rule in accordance with Decision 14-3/0.5 of The R&A/USGA Rules of Golf, which stipulates the device can be used to measure distance only (use of functions to measure slope, elevation or wind will not be allowed). The Web.com Tour tournaments are: the BMW Charity Pro Am presented by SYNNEX Corporation, May 15-21 in Greenville, S.C.; the Rex Hospital Open, May 29-June 4 in Raleigh, N.C.; the Rust-Oleum Championship, June 5-11 in Ivanhoe, Ill.; and the Air Capital Classic, June 12-18 in Wichita, Kan.
PGA TOUR Latinoamérica will do its testing at the last four tournaments of the schedule’s first segment: the Essential Costa Rica Classic, April 20-23; the Quito Open, June 1-4 in Ecuador; the Puerto Plata DR Open, June 8-11 in the Dominican Republic; and the Jamaica Classic, June 15-18. The Mackenzie Tour-PGA TOUR Canada will test at: the GolfBC Championship, June 15-18 in Kelowna, British Columbia; the Players Cup, July 6 - 9 in Winnipeg, Manitoba; the Staal Foundation Open presented by Tbaytel, July 13 - 16 in Thunder Bay, Ontario; and the Mackenzie Investments Open presented by Jaguar Laval, July 20 - 23 in Mirabel, Quebec. “For years there has been significant discussion and debate about whether distance measuring devices would have a positive or negative impact on competition at the highest levels of professional golf,” said Andy Pazder, Chief Tournaments and Competitions Officer of the PGA TOUR. “The only way we can accurately assess their impact is to conduct an actual test during official competition on one or more of our Tours. We look forward to seeing how these tests go and carefully evaluating the use of the devices over those weeks. Our evaluation will consider the impact on pace of play, optics and any other effects they might have on the competition." Once the test and comprehensive evaluation is completed, the PGA TOUR will share the results with its Player Advisory Council on all of its Tours for additional review and discussion. Hahn: "If you’re going to allow measuring devices, you might as well allow carts because that speeds up play." Maintaining the challenge and spirit of the game while allowing distance measuring devices, as long as they don't measure that other stuff? We at State of the Game don't want to overextend ourselves with the new wraparound schedule, so after a not so short holiday hiatus we are back with episode 33. Rod Morri, Mike Clayton and yours truly talk to Golf World contributing writer Brett Avery about the new Golf World 100 Best Modern Players ranking. I think when you hear Brett and also see the package in Golf World, you'll come away realizing how incredible Tiger has been over the last fifteen years. To see someone quantify it puts things in perspective. We also cover the upcoming decision on distance measuring devices, and feed off of Brandel Chamblee's recent articles on the best and worst developments in the game. As always, you can listen below, download the MP3 or listen/subscribe via iTunes. This appears to be moving us one step closer to distance measuring devices becoming kosher in the game...I'm sure you can sense my euphoria. The studies gathered information from parents, juniors and staff about types of rangefinders that are most popular among juniors players and how allowing their use might affect pace of play. In 2012, the average 18-hole pace of play for all AJGA events was 4 hours and 23 minutes. AJGA studies showed there was not a major impact, positive or negative, on pace of play where rangefinders were used. "I urge you to stay strong and just say no to rangefinders and GPS devices. I want to play slower. I want inaccurate yardages when I compete on poorly marked courses." Gary Van Sickle melts down over the continued ban on rangefinder use during PGA Tour play, an issue on the priority list somewhere between "revisiting the gallery ropes" and "should we send out scorers with each group." "Most time is lost on the greens." 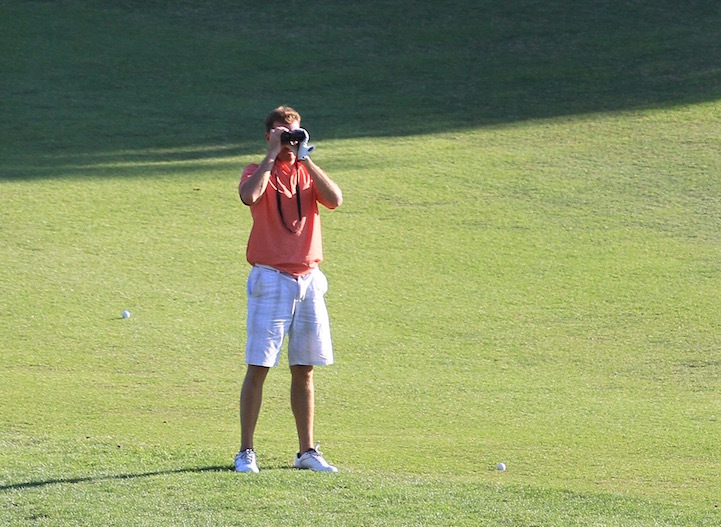 Watching the tepid pace of play during round 1 of The Players, I wondered if rangefinders would help. After all they were billed as a savior of the game a few years ago but have not made it to regulation PGA Tour play (they can be used in practice rounds). Has anyone heard of any studies or stories documenting actual improvements in pace of play thanks to distance measuring devices? "The forward-thinking PGA has agreed to allow GPS use across its tournament calendar in 2008"
SkyCaddie today welcomed the PGA’s groundbreaking decision to sanction the use of GPS rangefinders in its professional events this year – including the Irish PGA Championship, Scottish PGA Championship and the Glenmuir PGA Professional Championship. The market-leading distance measuring device was made official rangefinder of the PGA earlier this year and was used to monitor pace-of-play statistics during the PGA’s prestigious Glenbrae Fourball eight qualifying rounds and final at Fulford Golf Club in October. Now, following positive results, the forward-thinking PGA has agreed to allow GPS use across its tournament calendar in 2008 – a decision taken at its executive committee meeting on 15th January. Other leading golf bodies are now expected to monitor closely the success of the scheme. “These partnerships will help bring to life the amazing feats that occur each week on the LPGA Tour, such as crushing 275 yard drives..."
DAYTONA BEACH, Fla., Jan. 26, 2007- The Ladies Professional Golf Association (LPGA) and the Golf Channel have each partnered with SkyGolf, makers of the SkyCaddie® GPS rangefinder, to provide enhanced, real-time information to viewers during live LPGA tournament broadcasts. Analysts will be utilizing SkyCaddie® rangefinders to provide real-time information to viewers of LPGA telecasts on ESPN2 and the Golf Channel, beginning with the Golf Channel's broadcast of the SBS Open at Turtle Bay, Feb. 15-17. Viewers will be given comprehensive information, including players’ driving distances and positioning, such as distances needed to clear or lay up in front of fairway hazards. The inclusion of this cutting-edge technology and production enhancement represents the first time advanced GPS technology will play such an integral role during LPGA golf broadcasts. The SkyCaddie® rangefinders use the same global positioning system used by the U.S. military, but in a highly portable handheld device about the size of a cell phone that can compute distances to any point on a golf course. Even Bivens in her prime can't top that...crushing 275 yard drives? I wonder if they'll plug the SkyCaddie numbers into WinZone in order to make it, well, work? John Paul Newport pens one of those strange WSJ columns where he first makes a point to let us know that distance measuring devices have not only not ruined the game (did anyone ever write that they would? ), but have actually been a positive addition to his game. And then he pretty much dispels any notion that they speed up play or add any real great pleasure for his game, except on courses he hasn't seen. Thanks to reader John for this. If you don't think laser range-finders are going to be commonplace and widely accepted within a few years, think again. They're apparently going to be used during the Ryder Cup matches -- just not by competitors during the competition. Many Tour pros and caddies already use laser range-finders during practice rounds to check yardages. At the Ryder Cup, range-finders may be used by SkySports and NBC so their television spotters can relay accurate yardages to the broadcast teams. The K Club, the host site, was an early customer of Laser Link, the range-finder firm based in Madison, Wis. Reflectors are installed in the flagsticks so the lasers can more easily pick up the target, and the K Club plans to leave the reflectors in during the matches. Laser Link founder Rob O'Loughlin was surprised when John McHenry, the K Club's golf director, told him the plan. "I don't see how the PGA of America would sit still for that. It'll never happen," O'Loughlin said. "John said, the Ryder Cup host makes the decision and I'm the host. I've already talked to the European PGA Tour. The decision is made. It's wild." Then a PGA of America rules official heard about the idea and thought the Laser Link guns would help the officials who officiate the Ryder Cup matches. Their purpose? To determine who's away from out in the fairway, a common match-play question. There's a moment to look forward to. Some bloated rules official sauntering between balls, pulling out his distance measuring device, and declaring who is away. What progress. Jim Achenbach's column below has raised more questions about this idea that a player can have a Bushnell 1500 Slope Edition Range Finder in their bag, or pocket, but will only be disqualified if they use it. Previously we were led to believe that if you set foot on the course with the "Slope Compensation" model, you were DQ'd. But now we learn you could theoretically have both models in your bag, as long as you don't pull out the Slope model. So they look kind of, uh, identical. Naturally, this is brilliant from Bushnell's perspective, forcing possible cheaters to buy two instead of one! Now, if a competitor asks to check their playing partner's rangefinder mid-round and determines that is in fact the Slope edition, will they be disqualified for having used the Slope version to determine whether it was a legal device? Has the USGA asked Bushnell to differentiate the models so that players and officials can easily decipher between the Slope and "Tournament" devices? And how is Bushnell able to use Slope, which the USGA seems to have copyrighted and displays as Slope Rating ®? Do they only have the rights to Slope Rating and not Slope? Lawyers? It would seem that the only way to ever be sure that Slope measuring devices are not used is to actually make it illegal to one in your bag or in your pocket while playing a competitive or for-handicap-purposes round.